Quick recap: the Molded Dimensions Team earned best technical paper for their work as the Urethane Restoration Team. The Team sought to find the root cause of the amount of scrap that was being produced each week at Molded Dimensions. We’ve talked about the problem, the strategy, temperature variation and flatness. Today we’ll talk about our methods and how we built the Urethane Manufacturing Team. As our process became more science and less art, we worked with our operators to standardize how they were pouring each job. We updated all our process sheets and put them in a standard format, removing some of quirky reminders that were no longer needed as well as the basics of urethane molding, leaving just the critical aspects of each job. For things that molders needed to know that were common across many jobs, we added a line item to our on-the-job training checklists to ensure that the supervisor covers that topic during their initial training. Some of our process sheets asked a molder to “spray lightly with mold spray” or “pour slowly” in a very specific spot in the mold cavity, but what is “lightly” or “slowly” to one molder may mean something a bit different to another. A picture is worth a thousand words and a video is worth a million, so we created videos of pouring and de-molding techniques that operators watch when they set up a new job. This is particularly helpful for our off shift molders who do not always have coaching and technical support from lead people or engineers when they start to have problems. As leaders it is our job to get the right people on the team, and then give them the information and tools they need to be successful. We have found that using a tool called The Culture Index https://www.cindexinc.com/ we can do a better job hiring people who thrive in their roles at Molded Dimensions. Each of our satisfied employees has taken a brief questionnaire that generates a simple six-variable profile. 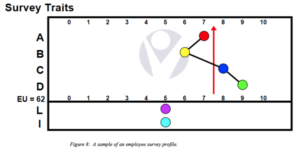 The variables in their profile indicate things like a person’s ability to follow direction from a supervisor, willingness to do repetitive work, attention to detail, and social ability. We use the profiles of people who are happy and successful in their roles as targets for the profiles of prospective employees. There is no one “ideal profile” but ensuring people are placed in roles that best suit them makes it much more likely that the new employee will be happy and successful. We have also added a half day of finishing work as training for each new molder within the first month or two of their training as a urethane molder. This helps them understand how their molding effects the quality of their parts and the workload of the person downstream from them.